The ilium is the uppermost and largest bone of the pelvis. The ilium articulates with the ischium, sacrum, and pubis. The ilium is divisible into the body and the ala, or wing. The body and ala are separated by the arcuate line on the posterior surface and the margin of the acetabulum on the inferior surface. The iliac crest is on the upper margin of the ala. The external surface of the ilium is partly articular (relating to a joint) and partly non-articular. Bi-iliac width is an anatomical term referring to the widest measure of the pelvis between the outer edges of the upper iliac bones. acetabulum: A concave structure formed from three bones in the pelvis that articulates with the femoral head to form the hip joint. ilium: The upper and widest of the three bones that make up each side of the hipbone and pelvis. pelvis: The large compound bone structure at the base of the spine that supports the legs. It consists of hip bone, sacrum, and coccyx. The ilium is the uppermost and largest bone of the pelvis. It articulates with the sacrum, ischium, and pubis. The human ilium is divisible into the body and the ala, or wing. These two parts are separated on the superior surface by a curved line known as the arcuate line, and on the inferior surface by the margin of the acetabulum. 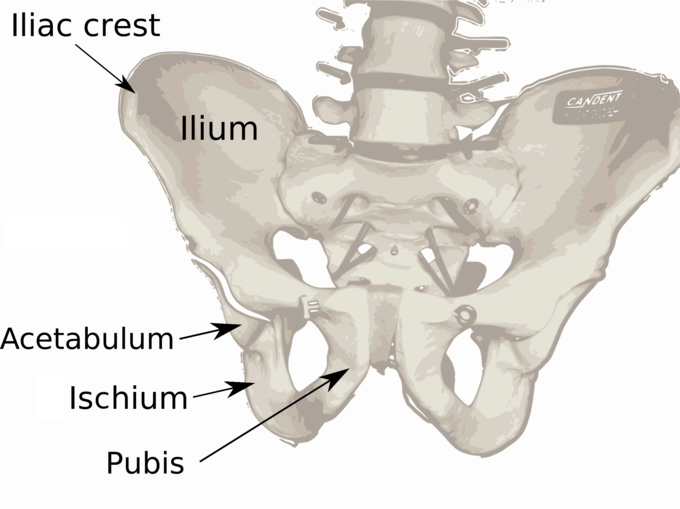 Ilium: The ilium is the uppermost bone of the pelvis and extends laterally. The body contributes to the formation of the acetabulum, a concave structure where the head of the femur articulates to form the hip joint. The internal surface of the body forms part of the wall of the lesser pelvis and gives origin to some fibers of the obturator internus muscle. The ala or wing, is the large expanded portion that extends laterally. It has an external and internal surface, a crest (illiac crest), and an anterior and posterior border. The external surface is smooth and divided by three lines: the posterior, anterior and inferior gluteal lines. The gluteus maximus originates from the external surface adjacent to the posterior gluteal line, the gluteus medius from adjacent to the anterior line, and the gluteus minimus from the inferior line. The internal surface of the ala is smooth and concave and forms the iliac fossa. The sacrospinalis and multifidus muscles of the back originate in the posterior. In humans, bi-iliac width is an anatomical term referring to the widest measure of the pelvis between the outer edges of the upper iliac bones. The bi-iliac width measure is helpful in obstetrics because a pelvis that is significantly too small or too large can have obstetrical complications. It is also used by anthropologists to estimate body mass.